➢ “There’s nothing radical or challenging about Riviera: It efficiently combines elements of soap operas, murder mysteries and thrillers, and, as the frosting on top, it gives viewers a peek at the luxurious lives of the oligarch-adjacent global elite. Designer gowns, devastatingly expensive paintings, drop-dead real estate and fast cars are the order of the day, but those baubles are tastefully displayed within a story that appears to have a solid foundation and promising premise.” — Variety. ➢ “Riviera reveals itself in its opening credits, a dizzying, vacant kaleidoscope of villas and fine art. The 10-part drama, billed as a thriller, spends almost as much time luxuriating in wealth as it does telling its story. And that’s a shame, because an intriguing plot simmers behind those lingering shots of the Mediterranean coast. 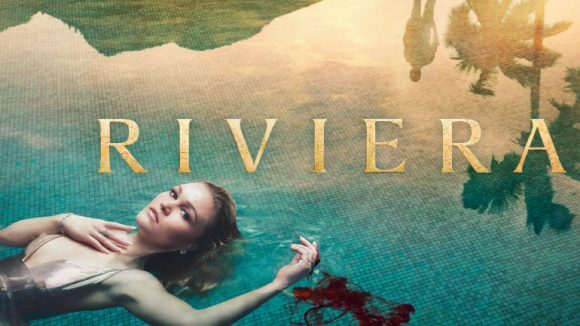 Think of Riviera as Revenge in the south of France.” — Entertainment Weekly. ➢ “The miniseries’ pedigree on paper is impressive; it’s created by The Crying Game writer and director Neil Jordan, from ‘an idea’ by superstar rock manager Paul McGuinness, with some early-episode screenwriting by prize-winning novelist John Banville (The Sea, The Infinities). (As Benjamin Black, Banville is also the author of several works of crime fiction.) There is a joke somewhere in here about three Irishmen going into a bar; certainly, one can imagine that Riviera was hatched in one, over a couple of rounds.” — Los Angeles Times. ➢ “Something went awfully wrong in the translation from idea to execution. And, according to an interview Jordan gave to U.K. newspaper The Guardian, that something isn’t too difficult to suss out: The finished product was worked over pretty thoroughly after he and Banville left the project after those first two episodes. For his part, Jordan has thoroughly distanced himself from Riviera (which saw huge ratings in Europe but was savaged in many reviews).” — The Hollywood Reporter. ➢ “Riviera’s central idea — that outward wealth often conceals darkness — is laboured to a maddening degree. And the climax, which we won’t spoil in case you go on regardless, feels wildly misjudged. Yes, it looks great but Riviera is overly serious, frequently implausible and not terribly memorable.” — Empire.